A Kickstarter campaign to bring back a classic portrait lens has already broken through its goal, just days after being launched. The Emil Busch Glaukar 3.1 lens was originally released in 1910, and was notable for its correction over spherical aberration, coma and astigmatism – something no other lens in daily use could achieve. Now, German photographers Benedikt Ernst and Firat Bagdu have started the campaign to bring a reproduction of the 97mm f/3.1 lens to life – and have already exceeded their $60,000 target. 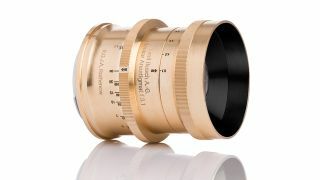 The new lens is set to sport the same brass appearance as the original, but will be crafted from high-end aluminium, with a brass-like oxidation. This, the pair claim, ensures the durability and mechanical precision of a modern lens. Thanks in part to specially coated elements and 12 aperture blades, the lens will deliver "a fascinating mixture of sharpness, strong colors... and wonderful bokeh effects." Although the lens was originally intended to be made available in Nikon, Canon, Sony E, Fujifilm, Micro Four Thirds, Leica M and Leica T mounts, the pair updated the campaign to say that a Pentax K-mount option may also be possible. Although they have not confirmed a retail price for the lens when it eventually goes on sale, early backers have already managed to secure their own copy in exchange for a pledge of $699. The pair anticipate that the lens will become available in summer 2018. For more information, and to see image samples captured with a prototype of the new lens, head over to the Kickstarter campaign.